The Giveaway runs from 29th (8am IST) of June to 29th of July (8am IST). Winners will be picked by using Random.org and announced on Facebook & Twitter. I will also email you on the address you use to enter this Giveaway. You MUST use the widget below else your entry wont be recorded and all the entries are mandatory! I love Revlon lipbutters this summer. They are one of the best moisturizing products I have used. My favorite beauty product is Loreal lipstick. Its my favorite product. It suits me well and it enhances my beauty. So I love Loreal lipsticks. i do not participate in many giveaways.. bt i have surely participated in urs... Congrats on ur 100+ likes..
My favorite beauty product is "Maybelline Baby Lips Lip-balm" because it moisturizes my lips and prevents it from drying up. My lips become soft, smooth and beautiful when I use it. If I have to pic one fav product, then it ll be my TBS brow kit! My favourite beauty product will have to be lip balm. I hate having dry, chapped lips. First of all my heartiest congratulations to you on this fantabulous giveaway of yours.I genuinely wish you have many more followers in the future as well. 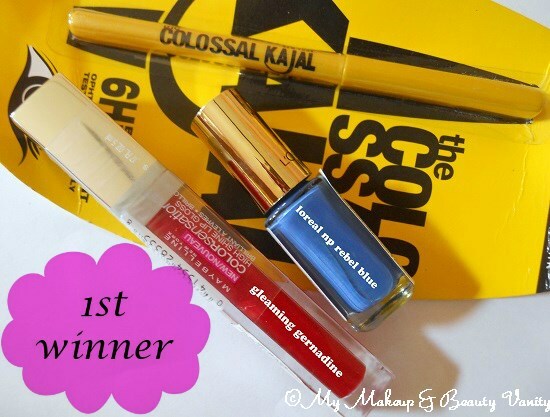 Well,my favorite beauty product is definitely Maybelline - Colossal Kajal ! My favourite beauty product is maybelline foundation mousse because its really very good and makes me look beautiful.It also hides all marks on my face and making the skin look fair!My makeup is incomplete without this must-have product.It really helps me.I just love it and the finish it gives. Hey Riya, love your blog!! Congrats for the 100 followers. My fav product is maybeline bb cream and lotus eye liner!.. i have participated in this giveaway with great heart!! really wish to win.n i request you to kindly confirm my entry!! yeah i completed all steps..hope to win.. 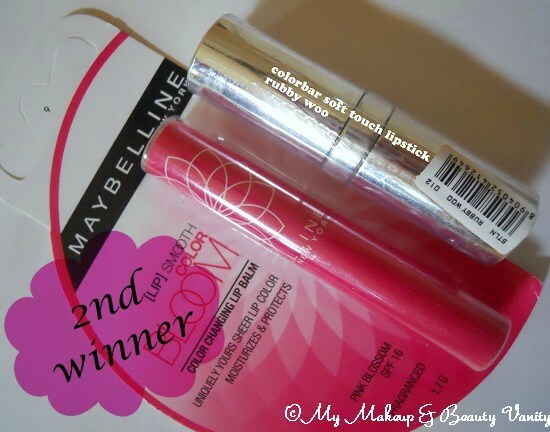 I want the second prize actually, coz i love lipsticks.. I love my colosal kajal from Maybeline and my lipgloss from Mac..